Let me start by saying that change for change sake is not typical of my nature. I’ve been married to the same wife for 40 years and I typically drive a pickup for 8 to 10 years before trading it in. I’ve not been that way with guns, however. I’ve carried a lot of different guns over the past seven years and figured I’d share with you some of my findings in this post. I read a statement recently by a firearms instructor who advised carrying “the same gun in the same place, every time.” I fully understand the value in that statement. When the chips are down and it’s time to defend yourself, you don’t want to have to think about your actions. You want them to be automatic. That said, I shoot and have shot enough handguns, that I’m very comfortable with whatever I happen to be carrying at the time. As a flight instructor I flew as many different airplane types as I could. I wanted to be familiar with whatever my students might be flying so I could impart knowledge tempered with experience to them. That’s one of my reasons for having carried a variety of handguns. There are two other reasons. One is being in the gun business affords me the opportunity to acquire some really nice guns at prices that are hard to pass by. So, I’ve become a collector of sorts. The other reason is I simply like guns. My first carry gun was a 9mm Taurus 24/7. It was a very nice gun and I shot it well. I later acquired a Taurus 24/7 in .40 S&W and then one in .45ACP. The only one I still have is the .45. One of my sons has the .40 and I sold the 9mm to a friend. If I ever find another one like it for sale, hopefully I can grab it up. The Taurus 9mm was replaced by a Sig Sauer SP2022 which was joined by a Beretta PX-4 Storm. I still have both of those guns, each of which as had approximately 5,000 rounds shot through it and both of which continue to function flawlessly. Needless to say, their actions are extremely smooth now! When I first began carrying as a licensed CHL holder I was convinced 9mm was the caliber to be carrying, especially with good defensive ammunition such as Hornady Critical Defense, Speer Gold Dot, Remington Golden Saber and others. I’ll admit my CHL instructor was a diehard .45 ACP fan, but I just figured it was because he’d been a Marine firearms instructor, set in his ways. I began to notice over time, however, there were more experienced shooters and instructors who leaned toward the .45 than there were those who did not. As I began attending advanced NRA instructor courses, I asked a lot of questions. In one class the instructor talked about the possibility of over-penetration by 9mm bullets, especially at close range. Then I heard a testimony from a security officer who had been shot by a .45 in the chest while wearing a bullet-proof vest and the devastating affect it had on him even though it did not penetrate his vest. It took him out of the fight and kept him sore for days. I started doing my own research both online and by reading some every well researched books. The book with the most information I found on the topic is called Stopping Power by Evan P. Marshall & Edwin J. Sanow. If you read the charts and graphs and stories of real world experiences you’ll learn there really is an advantage to having a caliber that starts with a “4” as your personal defense handgun. I’m not saying other calibers won’t get the job done, though the .380 really is quite anemic when compared to its bigger brothers. My research indicates that a .40 caliber packs the most wallop of the big three, with a .45 following close behind. The .40 is packed to a much higher pressure in the shell case, and thus typically has more recoil than a .45. Frankly, I don’t enjoy shooting many .40 caliber handguns, but I find shooting a .45 isn’t much different than shooting a 9mm. As far as the .40 goes, you will find in many ballistic charts the energy on target as measured in ft/lbs. is slightly higher for the .40 S&W than it is for the .45 ACP. The .40 also carries more bullets. That’s why you’ll find so many Law Enforcement Agencies utilize .40 caliber handguns. My first .45 was the Taurus 24/7 and at first it had some ammo feed issues. My NRA Counselor suggest trying Winchester Silvertip ammunition. I did and it worked fine. Then after 200 – 300 rounds the Taurus would shoot anything. But a friend wanted it and I sold it to him. I’d just inherited a little money from my dad and after months of watching students in our CHL classes shoot ragged holes in the center of their targets with Springfield XDs I bought a full-size Sprinfield XDm .45. Now that’s a gun I felt good carrying and love to shoot. It makes me look really good in the accuracy department and it has always worked flawlessly. It’s a little heavy, but so am I and I’d already discovered the Crossbreed SuperTuck, a good inside the waistband (IWB) holster that makes carrying any size gun easy. I carried the XDm for the better part of the year with only one downside. Because it has an ambidextrous magazine release, if I wasn’t careful how it was positioned, my belt would ride up over the magazine release and compress it so the magazine would unseat. I found myself continually checking to make sure my mag was seated. That was not the gun’s fault. It was simply a wardrobe issue. I moved on to the Smith & Wesson M&P, first getting a .40 because the .45s were scarce, then adding a .45 when I could get one. I now have the .40 and the .45 and two 9mms, I like them that much. The 9mms are somewhat special. One is a VTAC model in dark earth with Viking Tactical sights and an Apex carry trigger kit. This gun is so cool, I sometimes revert to carrying a 9mm just to have it with me. The other 9mm is a Colorado Springs Police Department trade-in – like new and with night sights. I keep it in the console of my truck. The .40 has become my house gun with a Streamlight LED/Laser mounted on the rail. Smith and Wesson has an ad for the M&P line that says something like “Loaded with features; none you have to think about.” That’s a very appropriate ad. I was drawn to the M&P after witnessing several female instructors shooting them in tactical courses and doing quite well with them. Two of them had .40s and I asked them why that particular gun. Both answered similarly: they loved the way it felt in their hands and it seemed to have less felt recoil than other guns of the same caliber. I agree. My Springfield XD carries 14 rounds of .45 ACP. The M&P carries 11. With either, I carry a spare magazine IWB on my support side and I know I’m well armed. I’ve never been attracted to a Glock though we have two in my family. My wife’s primary gun is a Glock 19 and I have a Glock 22. It’s okay, but there’s nothing about it that makes me want to carry it or even go shoot it. That’s just me. If you love Glocks, you’re in good company and there is certainly nothing wrong with them. Let’s fast forward to today. Why do I typically carry a 1911 style pistol today? I’ve even spoken out in the past wondering what people saw in them, accusing them of following some sort of religion rather than just common sense. As I mentioned in an earlier post, the Colt 1911 and Springfield Loaded 1911 did nothing to convert me. But when I got a Ruger 1911 Commander, I drank the Kool-Aid that came with it. I fell in love with that gun! It looked good, it felt good in my hands, it shot good, I shot good with it! It’s also thinner than my other .45s, which makes it a little easier to conceal. I decided to carry it for a few days and the days became weeks and before I knew it that Ruger was my full time carry gun. A few weeks ago, a Remington promotion through one of our wholesalers put a few of their R1s in our hands. We tried one of each model they were offering at the time, which turned out to be four guns: a regular R1, a stainless steel R1, an R1 Enhanced and an R1 Carry. I put dibs on the R1 Carry and took it home. At the range it was flawless and accurate. I especially liked the fact that the slide was easy for my arthritic hands to cycle. The sights worked well for me and the gun looked good. I ordered some faux pearl grips and prettied it up a bit. I carried it for a few days, but the barrel jabbed into my leg unless I got it positioned just right. This is not a cheap gun and I think it’s well worth the price. If only it was convenient to carry as my Commander-sized Ruger. Remington recently offered a rebate on the R1s and as we were becoming informed about that, the R1 Carry Commander came into stock at a sale price that made it hard to pass up. I ordered one and when it came in, I sold my Colt 1911 to buy it. Immediately I found it had several advantages over the Ruger: 1) the slide is easier to operate, 2) it has an ambidextrous safety and 3) the front strap is checkered. So what difference does all of that make? Let’s take them one at a time. My hands often hurt. Cycling slides with very tough springs is difficult for me. (Sometimes opening a package of gum is difficult for me.) I don’t like to hurt. Although I am right-handed, the ambidextrous safety has a distinct advantage for me. I carry in an IWB holster on my right side. This holster is Kydex with a leather backing (a Crossbreed). Certain motions of my body, such as sitting down or getting up, at times will push the safety off. I check it periodically, but friction makes it sometimes difficult to get my thumb in behind the gun to check the safety. With an ambidextrous safety it’s a simple matter to check the safety to make sure it’s still on. Why the front strap checkering? 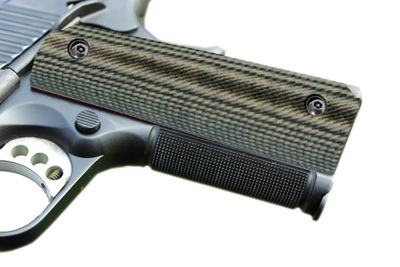 I like thin grips on a 1911. My hands just aren’t very big. Thin grips mean the grip panels must be pretty smooth. You can see the ones here I have on my gun. They are VZ Grips 320, Black Desert Tan. They’re perfect for my hands, but not very aggressive (VZ Grips makes a variety of aggressive grips in various patterns and textures – all of which you can buy on Amazon.com). The front strap checkering helps provide me with a good, solid grip that doesn’t hurt my hands. The Carry versions of the R1 are melded all over and have a Trijicon night sight in the front. They have a beautiful black satin finish and the workmanship is suberb. I’ve tried them with their native 7 and 8 round magazines and with Wilson Combat magazines and all have worked flawlessly. As with the Ruger, my trips to the range with either R1 have resulted in as tight groups as I can shoot with any gun. So far, each session has resulted in one ragged hole in the center of the target. Did the R1 replace the Ruger? Not totally. I’m thinking that instead of carrying a spare magazine on my support side, that maybe I’ll get a left-hand IWB holster and carry the modern day equivalent of what Roy Rogers carried – two forty-fives. Only mine will be Eight Guns instead of Six Guns! Meanwhile, I do like we did with boots back in boot camp–alternate every other day. Let me do a little recapping on my seven years of carry experience. I started carrying a 9mm, I now carry a .45. From a practical perspective the .45 is just as easy to carry and I have more confidence it taking down an aggressive attacker with it. I believe that with good defensive ammo, you’re adequately protected with a 9mm, 40 S&W, .357 Sig or .45 ACP. I just prefer the .45. I didn’t mention the gunbelt, but a good gunbelt is CRITICAL to successful concealed carry. Get a good gunbelt, a good holster and be willing to make a few wardrobe adjustments and you can carry pretty much any defensive handgun you desire to carry. Taurus 24/7 – I personally liked the older models better than the Gen 2, but that’s me. The Millennium Pro is just as good but without a loaded chamber indicator and a cocked indicator. Sig Sauer SP2022, P226 and practically any other gun Sig makes. I carry everyday, everywhere I’m allowed to carry. As a matter of practice I avoid places I’m not allowed to carry, unless for a very good reason. I don’t have a Crystal Ball that would alert me to when I might need the gun. People around me who know me, probably figure I’m carrying, but for the most part they don’t know. It’s something we just don’t talk about. Having a gun as part of your wardrobe necessitates being alert and aware at all times. I pretty much live in the yellow zone. If you carry a gun or are thinking about carrying a gun, read anything you can by Massaad Ayoob. Gun Digest has published at least two editions of the Concealed Carry Handbook by him. His original book In the Gravest Extreme is still in print and he writes articles in almost every handgun related magazine out there.